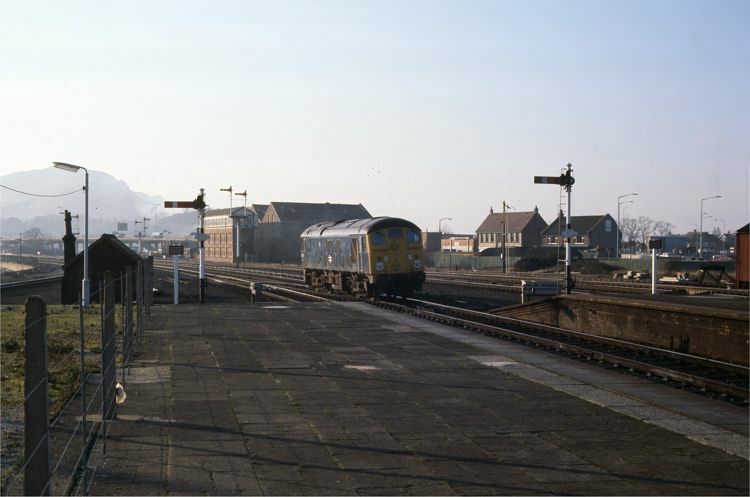 The same location and the same class of locomotive as last month - Class 24 24035 is seen at Llandudno Junction on the 10th February 1978. The engine has just come off the shed, and having reversed on the down line, is now crossing over to the up line to run light engine to Chester. The view is so different from that seen from the end of the platforms at Llandudno Junction today. The whole aspect is wide open, and the land to the right and left had not succumbed to supermarkets and roads. All signals in the station area were semaphore, worked from the large LNWR signal box. The track rationalisation in the late 1960's occurred mainly at the eastern end of the station, where Llandudno Junction No 1 box closed, and No 2 box, seen here, was adapted to control the whole station. Platform 3 (now 4), from which this picture was taken, was rarely used and was not lit, except by the lights seen on the left which faced the trackless opposite side of the platform! 24035 was one of the 7 Class 24s remaining in service at this time - a couple of weeks after the supposed final withdrawal date for the class. Nobody imagined what would happen in a few months time, when all the survivors took there turns on passenger diagrams along the coast. More pictures of those workings to come!